The meme-inspired altcoin has finally edged NXT in the race to land in the top five cryptocurrencies that have the highest market price. How did Dogecoin do it? PayPal. Just like Senior Director of Corporate Strategy Scott Ellison said, PayPal has established itself as a brand that braves innovations. The announcement of bringing Bitcoin to PayPal merchants was widely celebrated, especially for pushing the Bitcoin price to surge beyond the $450 mark. 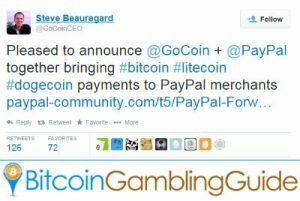 The Dogecoin price experienced the same fate after Steve Beauregard, the CEO of GoCoin—one of the three Bitcoin payment processors in partnership with PayPal—broke out the news on Twitter that Dogecoin and Litecoin will also be available on the PayPal platform. The market cap of Dogecoin, which is currently $32,128,744 and is almost $500,000 higher than the NXT market cap, jumped 10.34%. Its value as of writing has peaked at 83 satoshis, a steep increase from its roughly 30 satoshi price when September began, according to CoinMarketCap. Dogecoin as a payment option for PayPal merchants is more significant than the addition of Litecoin to the e-commerce business. Litecoin has always been perceived to be the second most successful and established altcoin in the cryptocurrency market, making PayPal’s acceptance of it likely to be expected. However, Dogecoin, which has recently been receiving hard blows from the market, can be considered a surprise inclusion in the PayPal system. Nevertheless, this only strengthens the reputation and financial power of the Shiba Inu-laden coin to stay in line with the demand in the digital currency market. Although Dogecoin has finally started to merge mine with Litecoin, which was heavily debated, anticipated, and planned months back, the GoCoin-PayPal partnership really gave the Dogecoin price its much needed boost. The renewed success of Dogecoin translates in the Bitcoin gambling market in a positive light. Since more Bitcoin casino brands now accept DOGE-denominated bets, gambling aficionados may once again find use for their DOGE in their wallets. Moreover, if Bitcoin gambling players wish to sell their dogecoins on the online exchanges, the price of the altcoin will be more than accommodating. Nonethelss, dogecoin gambling can be expected to only grow in popularity as the altcoin returns to the center stage. The latest development for Dogecoin only opens more doors for it to make its own success story, one that may one day be similar to that of Bitcoin.